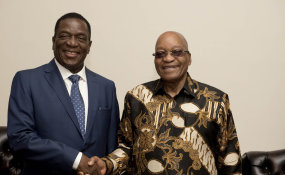 Presidents Emmerson Mnangagwa and President Jacob Zuma (file photo). President Emmerson Mnangagwa has arrived here for his one day working visit to meet his South African counterpart President Jacob Zuma as well as attend a high level business meeting that he will address this afternoon. The trip is part of President Mnangagwa's measures to revitalise the economy by attracting foreign investment. He was received at the Waterkloof Airbase by South African Minister of International Relations and Cooperation Maite Nkoana Mashabane and Zimbabwe's ambassador to South Africa Isaac Moyo. Currently, President Mnangagwa is having a meeting with South African President Jacob Zuma at his Mahlamba Ndlopfu official residence. President Mnangagwa is accompanied by his special advisor Cde Christopher Mutsvangwa, Foreign Affairs and International Trade Minister Dr Lt General Sibusiso B Moyo, Finance and Economic Development Minister Patrick Chinamasa, Industry and Commerce Dr Mike Bimha as well as Transport and Infrastructure Development Minister Dr Jorum Gumbo. Meanwhile, Environment, Water and Climate Minister Oppah Muchinguri-Kashiri has been appointed the Acting President. In a statement, the Chief Secretary to the President and Cabinet Dr Misheck Sibanda said, "During his absence and in terms of section 100 (1) (c) (i) of the Constitution, His Excellency the President has designated the Minister of Environment, Water and Climate, the Honourable Oppah Chamu Zvipange Muchinguri-Kashiri, as the Acting President of the Republic of Zimbabwe." In South Africa, President Mnangagwa is expected to address a high-profile business conference involving Zimbabwean and local business people keen on investing in Zimbabwe. The meeting comes at a time the Government has announced plans to amend the Indigenisation and Economic Empowerment Act that is viewed by some as a barrier to Foreign Direct Investment (FDI). The law requires foreign investment of more than US$500 000 to have at least 51 percent local share ownership with the investor retaining 49 percent. The proposed amendments to the law would see the 51 /49 percent requirement applying only to diamonds and platinum. During his State of the Nation Address yesterday as well as his inauguration speech on November 24, President Mnangagwa put economic growth on top of his priority list.